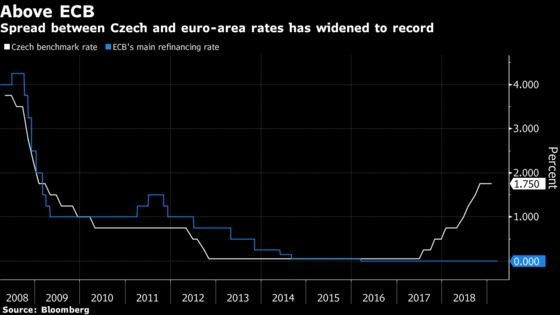 (Bloomberg) -- The Czech central bank will probably refrain from raising borrowing costs as risks of a global economic slowdown outweigh accelerating inflation at home. Expectations that surging consumer price growth would prompt a resumption in interest-rate increases went out the window this month after the U.S. Federal Reserve and the European Central Bank scaled back plans for tighter monetary policy. Forward-rate agreements showed that investors reversed their bets on a hike in March and now most analysts see the benchmark staying at 1.75 percent on Thursday. The Czech meeting is taking place just two days after regional peer Hungary signaled caution in tightening by adopting measures that both curbed part of its monetary stimulus and introduced new steps to boost debt markets. After delivering the swiftest interest-rate increases in Europe last year, the Czechs are weighing external risks including the potential impact of a disorderly departure of the U.K. from the European Union, against domestic inflationary pressures. Consumer-price growth accelerated to its fastest pace in 16 months in February, with core inflation running at a record high, fueled by a jump in salaries. But several rate setters have urged for caution over the effects of a slowdown in the euro-zone, with Germany the market for about a third of Czech exports alone. The koruna may also play a role. After its weakness was a key driver of last year’s rate increases, it has stuck close to the central bank’s expectations this quarter. Vice Governor Marek Mora and board member Tomas Holub said in March that a weaker-than-expected exchange rate could compensate for worsening foreign demand and won’t be an automatic trigger of hikes. By contrast, board member Vojtech Benda, who’s more hawkish, said persistent currency weakness could spur as many as three rate increases this year. Raiffeisenbank in Prague was among the seven institutions of 22 in the Bloomberg survey that’s forecasting a quarter-point increase. But it also saw the outcome of the meeting as “very uncertain” and said the risks from abroad could prompt board members to wait for a new forecast due in about five weeks.